Explanation: Grand spiral galaxies often seem to get all the glory. Their newly formed, bright, blue star clusters along beautiful, symmetric spiral arms are guaranteed to attract attention. 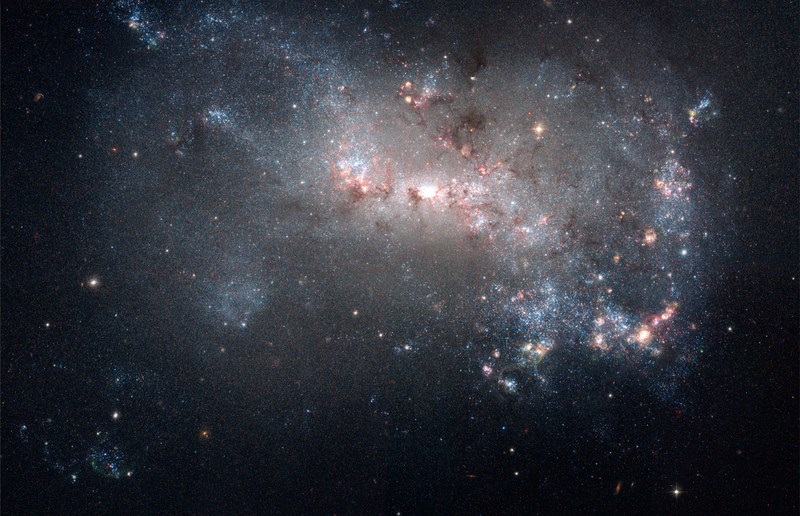 But small irregular galaxies form stars too, like NGC 4449, located about 12 million light-years away. In fact, this sharp Hubble Space Telescope close-up of the well-studied galaxy clearly demonstrates that reddish star forming regions and young blue star clusters are widespread. Less than 20,000 light-years across, the small island universe is similar in size, and often compared to our Milky Way's satellite galaxy, the Large Magellanic Cloud. NGC 4449 is a member of a group of galaxies found in the constellation Canes Venatici.